My friend Jo-Lynne has a fun little carnival going on at her place. The idea is to post the first sentence of the first post from each month from 2009. And as I was reading through mine, I was struck by the fact that I really need to rethink the way I begin each post. And maybe, just maybe, I shouldn’t whine so much. I thought it might be MORE fun to post the first comment I received from the first post of each month. Especially since much of the heart and soul of this blog comes from you guys. You continue to inspire and encourage me. And make me laugh. I am blessed to have so many sweet bloggy friends who stop by and let me know that I’m never alone in my insanity. “Well, I just can’t help you out. I know I looked into it a couple of years ago, but it was very costly at that point, so we stayed the route (me planning for 4 boys). I will tell you, planning on 3 levels is difficult, but doable. 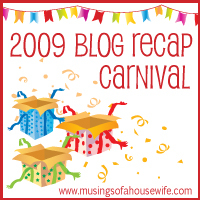 . .
Here’s to another awesomely terrific bloggy year! That is way too funny! Your blog has been a gift over the past year. I hope you know how much you are enjoyed and appreciated. LOL – well I DID have surgery in August. I am giggling about the “Weiner choir.” I think I am going to have to look that post up because it has my curiousity! *I* am giggling again about the Weiner Boy Choir! You should have seen those little 3-5 year old boys, it was hilarious! What a fun way to start my morning! 🙂 Thank you!